In celebration of the crazy spooky holiday today, I have put together a shabby Halloween card using the Pion Design Witching Hour paper collection. 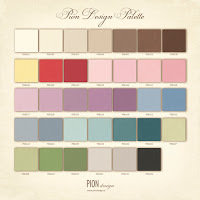 I absolutely love how Pion has made Halloween look chic with these delightful patterns and colours! I've received quite a few inquiries about where to purchase the Pion papers, so here are links to a couple of stores. Anyone looking for something in their area, please let me know. 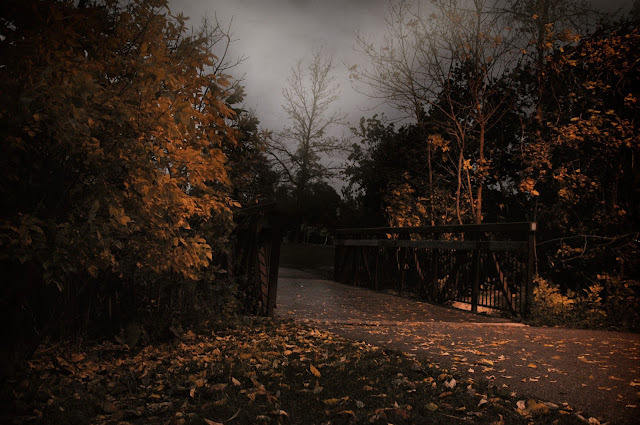 For my landscape photo today, I have a moody morning scene at the bridge beside the house. 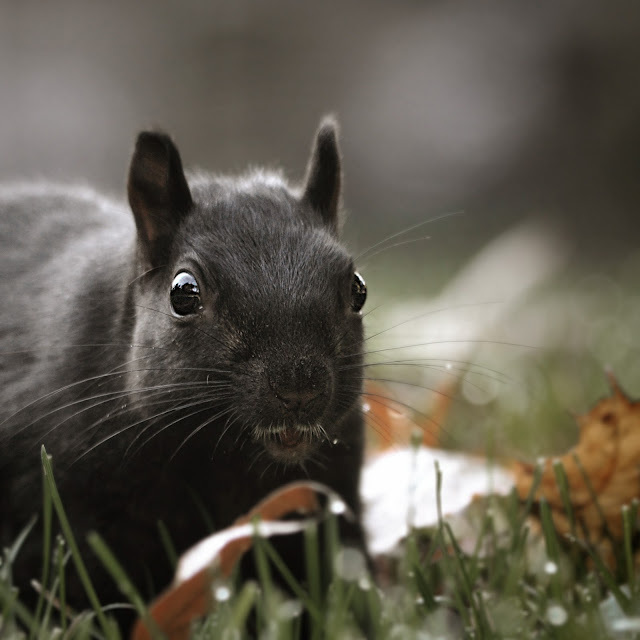 Out in The Shire, 'MR BLACK' and BON JOVI are enjoying a play in the leaves. HENRY is concerned that his salad is turning brown!! and this sweet female Cardinal pretends she DOESN'T look like a chicken!!!!! Back on the home front, something a little special for the occasion today. Does everyone remember the Haunted House that I made out of pizza boxes a couple of years ago? Well my good friend Niki of Pawsitively Creative Crafts suggested I grab some shots of Nemo checking out the house. Great idea Doc!! Beautiful choice of color and papers ! Gorgeous card Pamellia ! 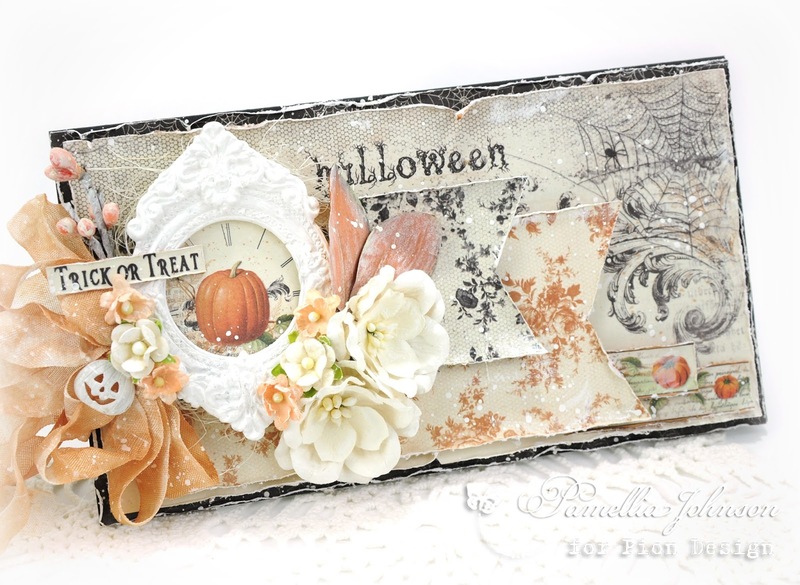 Oh my, Pamellia, only you can create such a stunning Halloween card in a shabby style! What a beautiful use of those amazing Pion papers! Your card is so elegant and dreamy and I love your flower arrangement with a perfect bow! 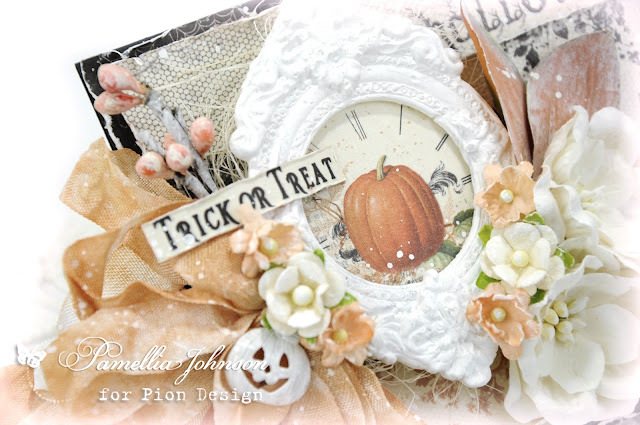 That frame is fabulous as weel as your small pumpkin element! I absolutely adore this card! 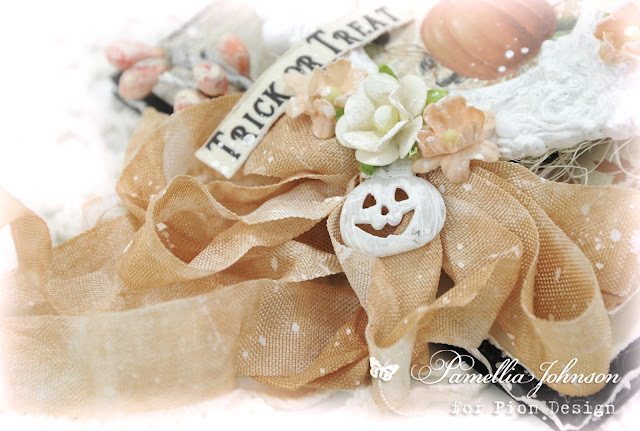 Halloween done done beautifully in your hands Pamellia, always love all those layers. Stunning card as always with lots of ideas to inspire. An AMAZING card and just gorgeous photos Pamellia! Wow Pamellia, your Halloween card is soooo classy!!! I have never tought that a Halloween card could be sweet, too! :D Breathtaking work of art! 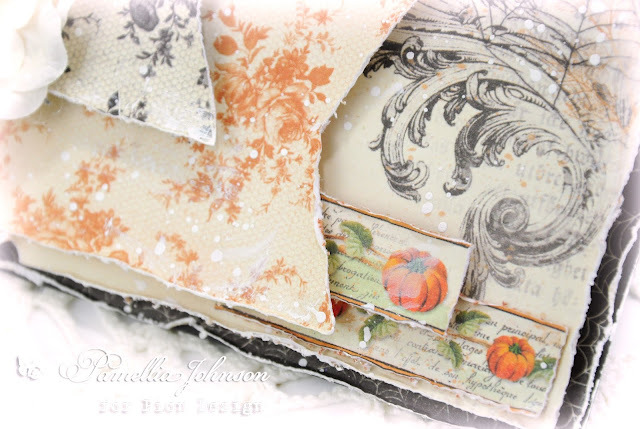 Amazing papers and details, love expecially the distressed banners and that white pumpkin!! Amazing shot of the bridge at early morning, pupkins and such a fabulous macro of these beautiful leaves! What a pretty card, Pamellia! Love those layers and the tiny flowers. I remember your pizza box creation--just the right size for Nemo! 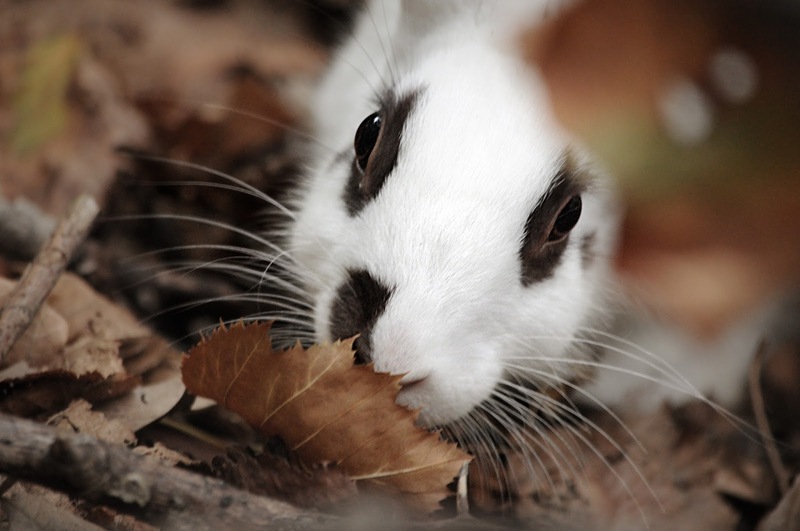 Wonderful photos especially the sweet critters! A card from you is always a treat! Love this pretty Halloween card, beautiful papers and stunning design as ever. 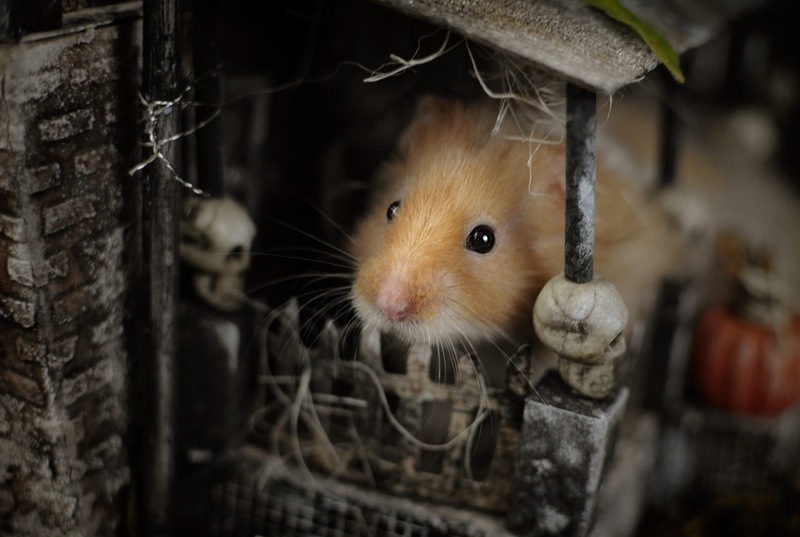 The first photo is amazing, so atmospheric, would make a fabulous Halloween card on it's own! I really don't know anyone else who can make Halloween look so beautiful and feminine - your card is incredibly beautiful!! Wonderful use of those Halloween papers - thanks for the link too. OMG,this is the MOST ADORABLE Halloween card I have ever seen. It's AMAZING!I just love it, Pamellia. You are truly an inspirational artist! Oh wow, what an absolutely stunning Halloween card, Pamellia!! You showcase the beautiful papers so perfectly!! I love the design and the layers!! And I love how you framed the pumpkin!! Elegant, gorgeous, shabby and fabulous!! I love it!! Amazing card, love it, very Halloween. -Love all your photos and I love the ones of nemo in that beautiful house of yours, that house is what bought you to me cannot believe its been 2 years gosh! 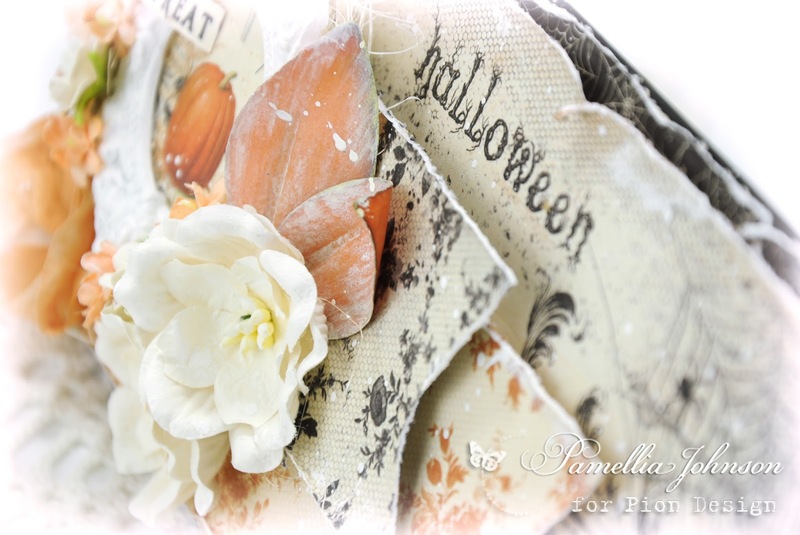 A fabulous chic Halloween card with lots of great details, love it. Wonderful photos today, especially love the ones with Nemo - quite spooky! Oh my goodness Pam what wonderful photos, I just love them, you really are a marvel with the camera. 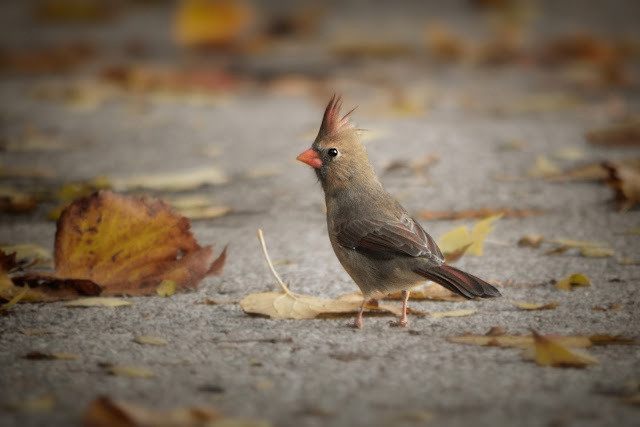 I love the little Cardinal bird, he is so cute. Love the shots of Nemo in your haunted house Pamellia, looks an amazing creation you made. Stunning Halloween card today, beautiful papers and gorgeous layers. 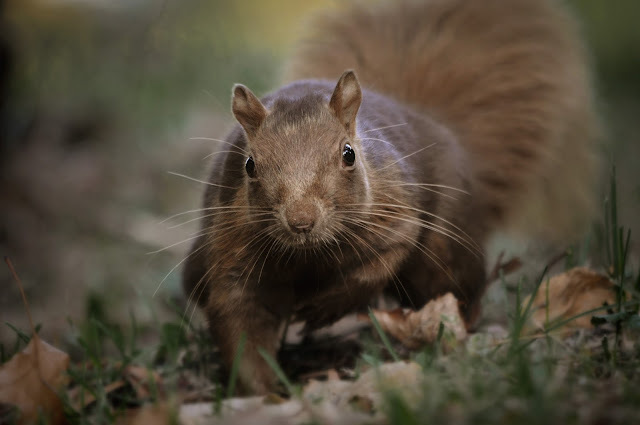 More of your beautiful wildlife photos.. Yes I do remember that haunted house and it's superb design. Great photos of Nemo taking in all the wonderful design. Super Halloween card and such gorgeous colour choices too. Those paper and elemnts are superb. An awesome card, you do make Halloween look frilly and fancy and not scary at all. I loved the photos, but have to say Nemo is the STAR today, exploring your haunted house project. Beautiful vintage card great choice of papers . I can remember that house it was awesome . Love all the photos especially the one of Nemo exploring . Wonderful Halloween card and great layering. 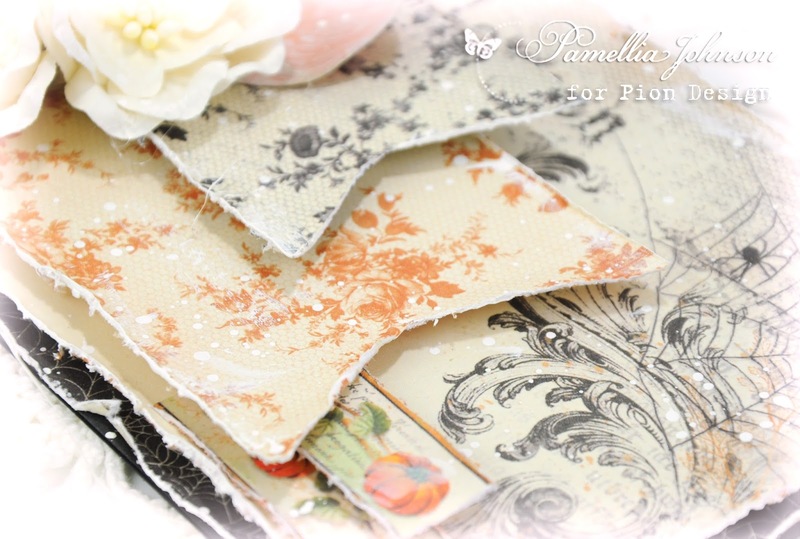 Aww Pamellia absolutely stunning Hun, the colours are fabulous, love it. Sorry I haven't been around much Hun, it's even a bit hectic here the last few weeks. Hope you are ok and all your fur babies. Pamellia, no one can make Halloween look so feminine and delicate the way you have! I love these papers and how you've layered them up with your gorgeous bow, frame and flowers! The pumpkin charm looks great in white--the perfect shabby touch! I love your landscape moody shot--it just screams Halloween to me! Oh, how I wish you were here to photograph my Halloween yard; I know you could make it look amazing! Your wildlife photos are amazing and the subjects are beautiful! I especially love the cardinal/chicken one! 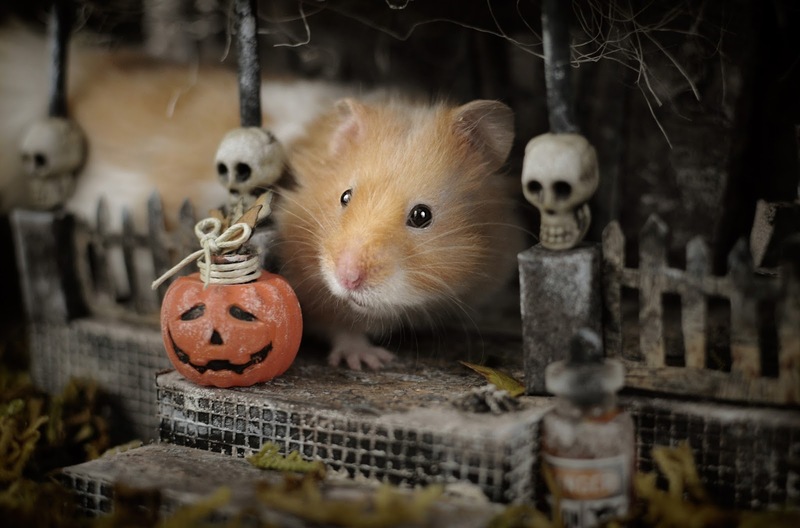 Nemo looks a little frightened by what he sees in your amazing Halloween House! So good to see that is getting some post time again! You can believe I visit it often! Sending huge hugs to you! Beautiful card and wonderfully festive post!! Your photos skills are just incredible Pamellia! What a sweet and gentle Halloween card in comparison to most! Very very pretty and 'safe' Pamellia. The shots of Nemo in your haunted house are PRICELESS. Wow. 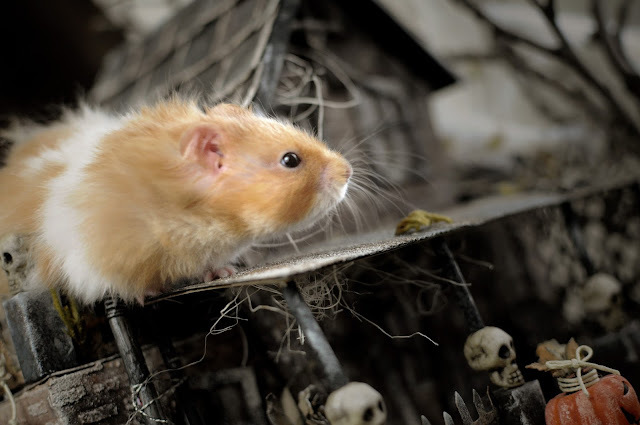 Those shots should be in an animal magazine somewhere on the cover for Halloween next year. Just amazing. Nemo is soooo adorable! Loved seeing all your forest family too. They look fat - getting ready for the winter - so glad. Hoping that you will be for you to get to The Shire when there is snow and ice on the ground. Knowing you... and your love for the outdoors in all kinds of weather - you will!! j. 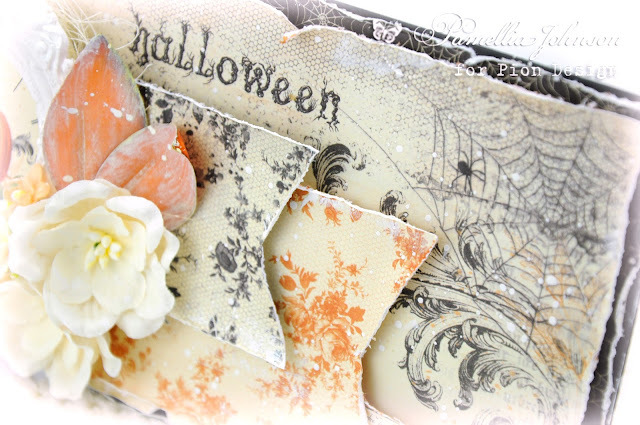 You have showcased those Pion papers beautifully in this Halloween card and in a shabby style too, genius. 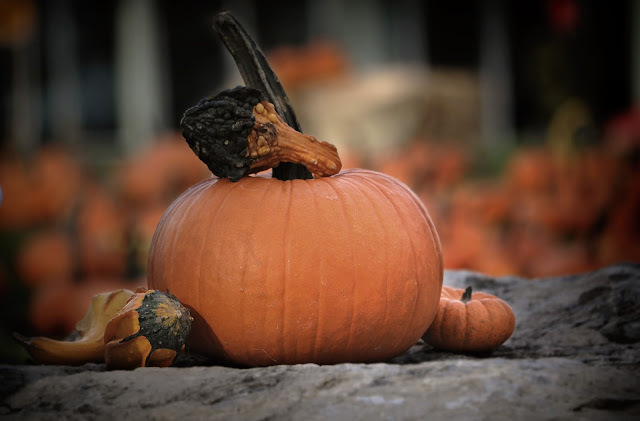 I love the little pumpkin nestled in the seam-binding bow. Now that's a card! That's more than a card. That's a work of art. I love your outdoor shots. So beautiful and I had a little laugh at the animals. Such cute things. It makes me want to take a little more time to appreciate the awesomeness around me. It's easy to get way too busy and pass it all by, eh? First-your card is spectacular and I am flabbergasted about how you can add such an elegant touch to a Halloween card!?! My brain is overwhelmed with it. Haha! Gorgeous, absolutely gorgeous. Awesome Halloween card! Wow, I do love these papers! Super fun patterns and great colors! I love all the fun details...always loaded with goodies! Your photos are amazing and I love your cardboard box haunted house and so does Nemo, lol! 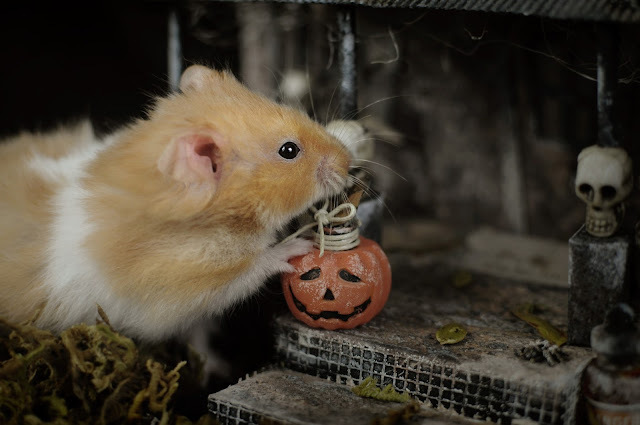 I hope you had a wonderful Halloween! Oh my goodness ... your card is gorgeous!! I really love the way you brought such elegance to Halloween ... And that little guy checking out your amazing house is so cool! Oh no, not Linda. I am so sorry Pamellia. Are Halloween cards supposed to be quite so gorgeous? Amazing papaers and I love the little pumpkin charm, just too cute. 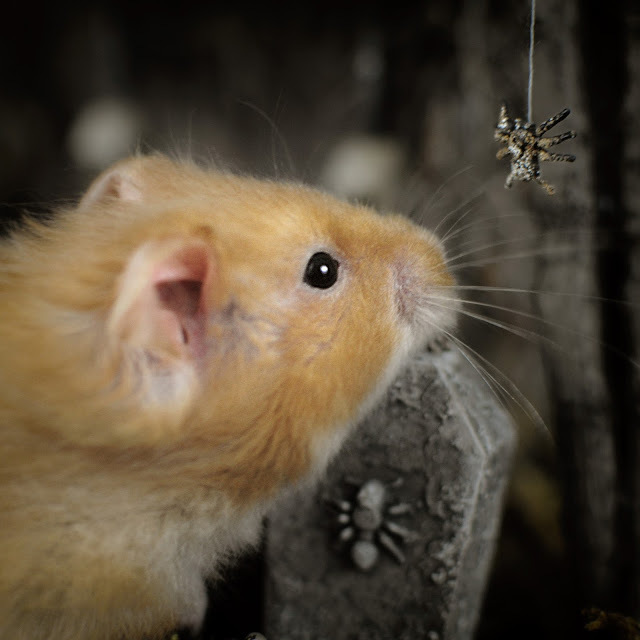 Beautiful nature shots again today, I just love them all and putting Nemo in the Haunted House is such a great idea. A really charming card - love the vintage nostalgia of it, and great to see Halloween in such delicate colour tones for a change. The photos of Nemo checking out your stunning house made me laugh - I've just shown them to Cestina (the dollhouse collector) and she loves them too. 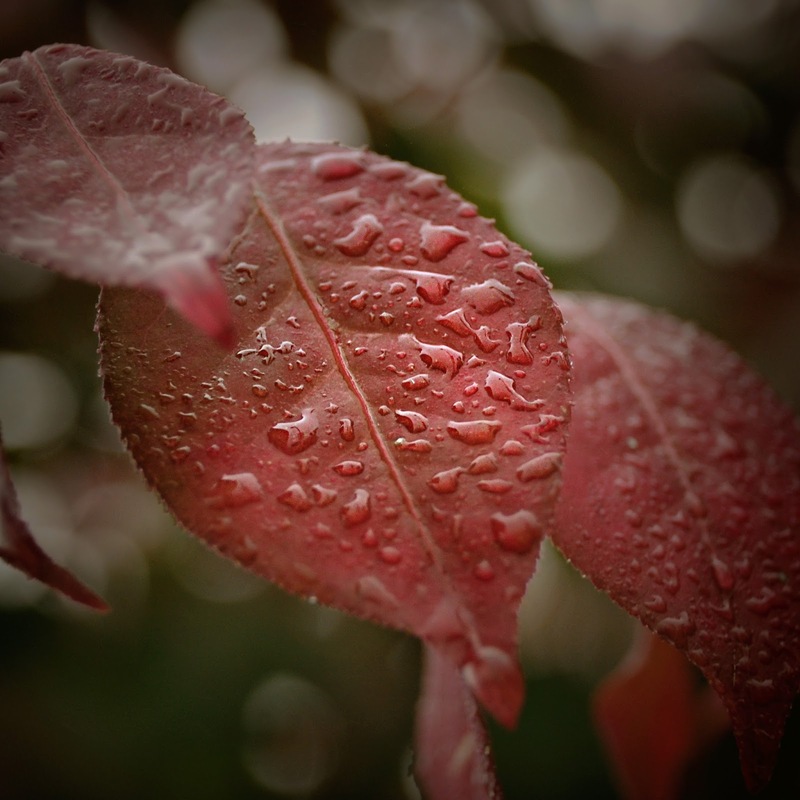 Gorgeous Fall photos - the autumn leaves are such a lovely feature along with the squirrels and co. Another fabulous macro picture too.